At Chinese American Progressive Action, we are strong advocates for an accurate count of Asian and Pacific Islander American communities in Census 2020. 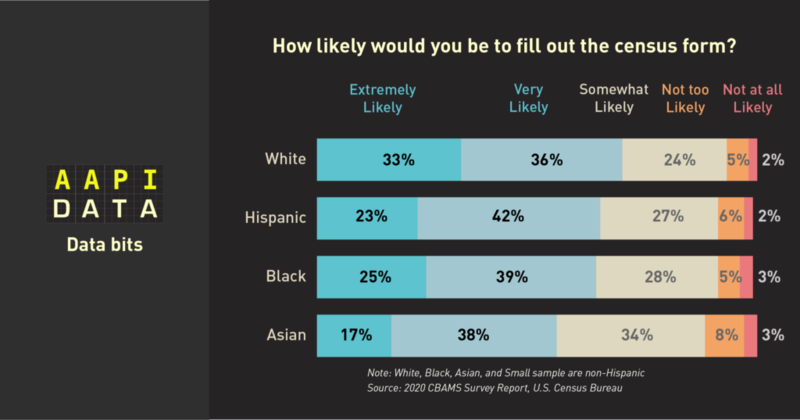 We are particularly concerned because recent research suggests that Asian American communities are the least likely to say they will fill out the 2020 Census form and are at great risk of being undercounted. A Census undercount means less political clout and representation. A recent research report by the Census identifies lack of familiarity with the Census as one reason Asian Americans may not be as willing as other groups to be counted. But threats to an accurate count are also emerging from our own specific community. A group of Chinese Americans has begun an effort to undermine the accurate count of Chinese Americans in the Census by calling for the removal of check-boxes that allow for Asian American respondents to identify with their detailed national origins (i.e. “Chinese,” “Korean,” “Indian,” or “Vietnamese”) and a boycott of the 2020 Census. Why? Some argue that the collection of detailed data represents a “backdoor to affirmative action” policies that they oppose, fearing that highlighting lower levels of educational attainment among some Asian groups in the U.S. like Cambodians will lead to policies that advantage such groups over those with relatively high average levels of education, such as Chinese. Others claim that Asian Americans are being “singled-out” for an ethnic registry since in the past the Census has collected detailed data on different Asian groups, but not African Americans and Whites. Notably, though, the Census research report finds that Asian Americans exhibited the highest levels of trust in government of any racial group. This reluctance to take part in the Census is also occurring in the midst of the current legal battle over the potential addition of a question about citizenship on the Census form. The effort to undermine the Census by this group of Chinese Americans is self-defeating and at odds with the interests of our community. For growing, but often ignored groups in the U.S., such as Chinese Americans, doing everything possible to avoid an undercount in the 2020 Census is critical. The Census is used to determine the proportion of Chinese in the nation and in state and local jurisdictions. This count determines the number of House seats in political districts, how more than $800 billion in federal agency funds is distributed, and helps to ensure no group is denied systematically the right to vote. For groups with relatively high rates of limited proficiency with English, such as Chinese, an accurate count of people of Chinese background is essential to protect voting rights and mandate the translation of voting materials. For example, using Census data, the Department of Justice (DOJ) was able to determine that the voting rights of Chinese Americans in Alameda County, CA were violated in 2011. Specifically, the County failed to provide adequate translation of voting materials for Limited English Proficient Chinese speakers. Similarly, in 2005, the DOJ used Census data on race and ethnicity to bring a case against the City of Boston for discrimination against Chinese and other groups, in violation of the Voting Rights Act’s prohibition against voting practices that discriminate on the basis of race or membership in a language minority group. These data are also critical for determining whether state and local government organizations should provide enhanced Chinese-language services, such as English-to-Chinese translation in hospital emergency rooms. We at CAPA are concerned about racial profiling of Chinese Americans. However, the Census is not a vehicle for the targeting of Asian Americans based on national-origin. We at CAPA are concerned about racial profiling of Chinese Americans. However, the Census is not a vehicle for the targeting of Asian Americans based on national-origin. In fact, our community has led the call for the collection of detailed data on different Asian-origin groups. In 1965, the United States lifted quotas restricting the admission of Asian immigrants to the U.S. The number of different ethnic groups from the Asia Pacific increased significantly. To better understand the situation of these ethnic groups, Asian American community leaders, politicians, scholars, educators, and students campaigned for more detailed ethnicity options. Following the lead of these Asian American groups, some Black and Latino advocates are also pushing for more granular ethnicity options. Since the 1980s, Hispanics have been able to choose among different ethnic options. (“Is this person of Spanish/Hispanic origin or descent?” The possible responses are: “No (not Spanish/Hispanic); Yes, Mexican, Mexican-Amer., Chicano; Yes, Puerto Rican; Yes, Cuban; Yes, other Spanish/Hispanic.”) Groups like the Asian Pacific Islander American Health Forum consider the collection of detailed data on our population a fundamental part of their civil rights agenda. One of the biggest and most important changes to Census 2020 from previous counts is that detailed ethnic data will be collected for all major racial and ethnic groups, not just Asian Americans. In 2010, the Census collected detailed ethnicity data for Asians, Hispanic/Latinos, American Indian/Alaskan Natives, and Pacific Islanders. That is, they asked people of these backgrounds if they identified with any ethnic subgroup (i.e. “Chinese” or “Vietnamese” or “Mexican” or “Cuban”). But in 2020, detailed ethnicity data will be collected for all racial groups, including all of the groups asked about ethnicity in 2010, as well as Whites and African Americans. It would be most consistent if ethnicity data were collected in the same way (either check-off boxes for each ethnicity or a place to write-in one’s ethnic identity) for all racial groups. However, the Department of Commerce, under Wilber Ross, President Trump’s appointed leader, rejected this “check-box” format for all groups. Some groups, including Whites and African Americans, will instead be allowed to fill in a blank box with their specific ethnic identity. For example, a White person filling out the Census can write in “German” “Irish” “English” “Italian” “Polish” “French” under the larger White category. The U.S. Census is a scientific endeavor, but few know that rigorous testing related to race and ethnicity questions was conducted by Census Bureau researchers, including a massive experiment concluded in 2012 and a National Content Test, the results of which were released in 2017. Scientific testing of the Census over the past decade has focused on how changes to questions about race and ethnicity might change the accuracy of counting various groups. This Census Bureau testing shows that when a generic “Asian” check-box is provided with write-in, rather than multiple check-boxes for different Asian groups (“Chinese,” “Japanese,” “Korean,” etc. ), then fewer Chinese are counted. When a specific check-box is provided for “Chinese,” there a higher proportion of Chinese counted, though the proportion of other groups, such as Japanese and Koreans, declines compared to when a single “Asian” check-box is provided. Census Bureau research shows that check-boxes for “Chinese,” rather than “Asian” provide the best counts of Chinese. (See page 89 of this report). Thus, the Census detailed ethnicity data show the numerical power of our growing Chinese community in the U.S. Collecting detailed data on Asian Americans increases the overall count of our community, including groups like Chinese Americans. It ensures that we get our fair share of government resources and is essential for our political representation and protection of civil rights.